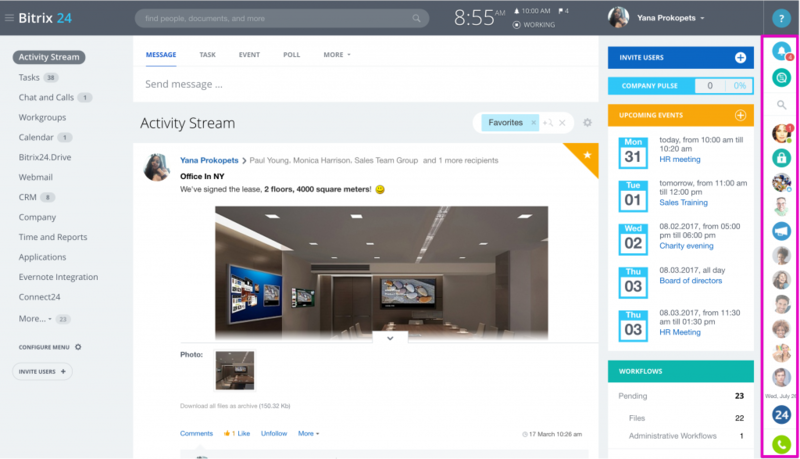 Web Messenger allows the account users to stay connected, communicate with colleagues and get informed of the new events right in the browser window. messaging history is saved on the server side and can be accessed and viewed by the users anytime, anywhere. All unread notifications and messages can be sent to the user's e-mail address if so configured in notification settings. 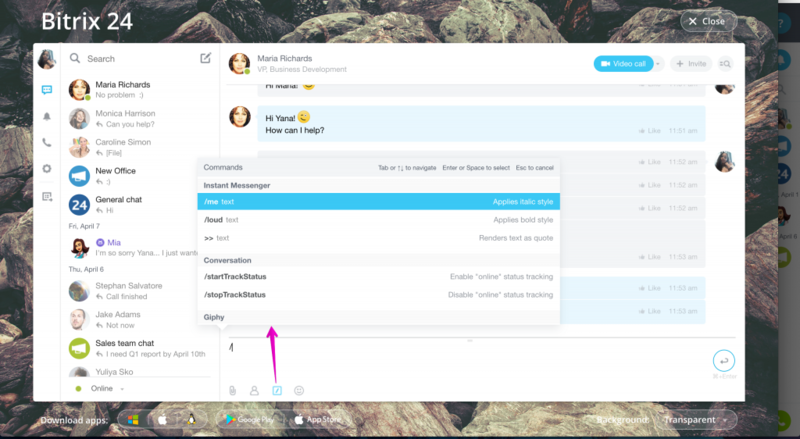 For example, if for some reason you are not logged in but there is a new task notification or an instant message in your messenger, you will be notified by e-mail. A stand-alone application for Windows and Mac OS X - Bitrix24 Desktop app - is also available. Once configured, it will connect to your account without having to log in every time you want to use it. If you have Bitrix24 desktop app active when you're working in your account in the web, you will be automatically redirected to the desktop app chat when you click on the right side chat icons in your account. Here is how to deactivate it. The internal messenger delivers system notifications and instant messages. Chats: person-to-person chats, private chats, public chats and general chat. Voice & Video calls: functions use your browser (support presently for Chrome 26.0 and higher) only. Access to video conferencing for groups up to 10 users is provided.If you are away from your desk, the IM will notify you about missed calls & add it to your call history. 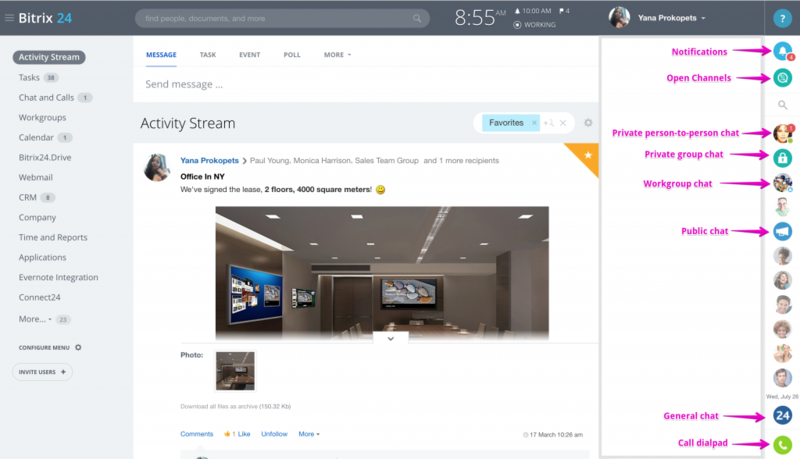 Screen sharing & HD video conferencing: is available via desktop app for groups up to 4 users (video). HD streaming via mobile devices is done in 16:9 aspect ratio. Importantly, if you don't have a high-speed Internet connection, you can still hold video conferences in standard quality. Screen sharing is also available (read more here). Notifications: all system notifications about various events are gathered here. Notifications can be configured here as well. Contacts search: with the most recent contacts displayed conveniently. Online status Indicator: online, away, don't disturb (the last one prevents messages from popping up and interrupting work, but an indicator still displays the number of new messages). Message History: all messages & files shared via IM are saved in history. Desktop app: a stand-alone application for Windows, Mac OS X & Linux(beta) is available. Besides web messenger options, desktop app also offers files synchronization between Bitrix24 cloud & user's computer. Mobile app: the app supports Bitrix24's chat, audio and video calls. New messages and notifications are pushed to you even when the application is closed. Available for iOS & Android. You can use Bitrix24 Messenger in the web version of your account, desktop app or mobile app. 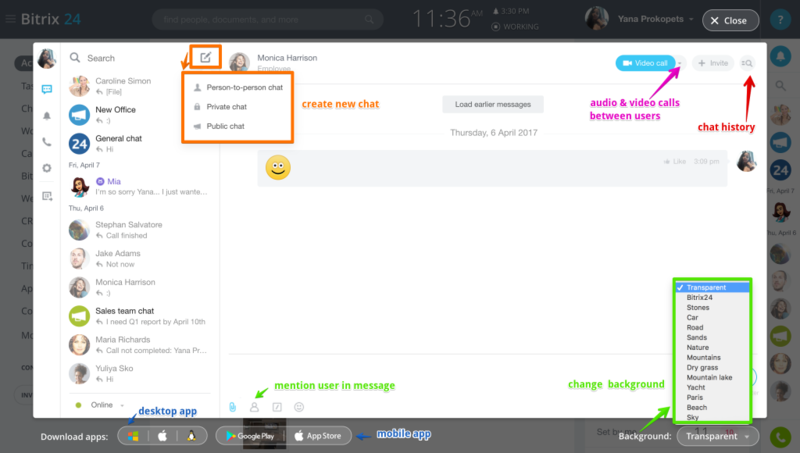 Use chat icons to create new chats & Invite option to invite new users to chat. Voice & Video calls option can be found in small chats consisting of up to 10 persons. Chat History is available inside each chat. If you'd like to mention a user in the chat message - use user icon located under the new message area. For web version of Bitrix24 messenger - you can change messenger backgrounds. By default, all users have a transparent background (see above), but you can set one of the suggested backgrounds as well (see below). Note: you can switch between Cmd+Enter (Ctrl+Enter) and Enter to send messages. To change the reply input box height, drag the top edge of the input box. Open Commands section to see available options - such as bold, italic or quote text.